Drafting your own sewing or knitting patterns means that you will end up with a custom-sized garment that fits you perfectly. It is a good idea to have a friend measure you so that you get accurate measurements. The importance of accurate measurements is in the fit of the final garment. If you miscalculate your measurements, it will not fit you correctly. Measure your armpit from the top of the armpit to the bottom. Write down this measurement. 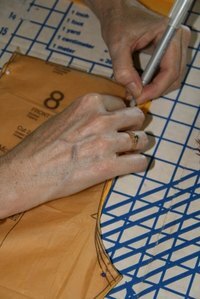 Lay out the pattern, and position the French curve against the armhole. Use the rounded part of the French curve to do this. Trace from the top of the French curve down to where your measurement ends. If you measured 12 1/2 inches, stop tracing at 12 1/2 inches on the French curve. Remove the French curve and stencil in the tracing marks darker. You are now ready to move onto your next drafting step.